Game example to show my assets. How much can you score? Thank you WolfTheDestroyer, I am reallt glad you and your friend have enjoyed the game. I am pretty busy with other projects at the moment, but I will keep developing 64-64 ill-fated ASAP. Please feel free to get in contact with my privately on https://www.facebook.com/Biim.Games/, https://twitter.com/Biim_Games, https://www.youtube.com/c/BiimGamesDev or https://www.patreon.com/BiimGames. I would like to propose you something due to your positive feedback. First, make sure to have the gamepads/joysticks connected before launching the game. Then for every player using a controller, let them press the B button or button N. 2 if you use a joystick (arcade handmade included). Please keep in mind that only player 1 and 2 can use a keyboard, so if you don't have enough controllers for all players and someone have to use the keyboard, let them be the first players. Let me know if you have any issue with that. I haven't played the game yet, but just watching the video I am really glad you did this game. The job is great and everything and even more is there. I used to play this King's Valley on MSX and you brought back very nice memories. Hi, is this just an art asset as the previous ones or is it a demonstration of something? The art is really nice as usual but clicking nothing happens. FPS on Rails Template community · Posted in Bought this.. any updates planned? first of all, thanks for your purchase, I am happy you find this template interesting for you. At the moment I don't have any planned update since I am very busy working on other projects. I am however open for future updates. Once I receive many requests for the same features, I will see if I can include them with a next release. About the dynamite and incoming projectiles, in the meantime, you could try to add it by yourself following the same technique used to enlarge approaching enemies. They would work similarly. Is this your first time working with Construct 2? I am not sure if it is worth to publish on Play Store as first game, but definitively you can try to publish it here and other platform to get more feedback and learn more from that. Once you get enough feedback, then you can evaluate if start a new game or keep working on this and then publish on Play Store or similar platforms. Nice little game, especially considering that is your first time using Godot. The game has a nice art and music. The voice is a bit strange but you will get use to it after playing some games. The jump motion seems having an unnatural movement sometimes, like hitting an invisible roof/boundary. With a little bit of more work you can make of it a nice time waster, maybe adding some enemies to avoid as well. The font is nice but not easy to read, and due to the small resolution (at least in the HTML5 game on itch.io, probably due to your resolution setting, it is impossible to read the text at the start of the game. Overall a very nice job considering your first attempt. Well done! I wanted to add an alternative Moon to the one that you can see at the beginning, in case someone wants to make something different. It is a sort of "bonus" that I added at the end. If this pack will sell well I might create a new Moon as well with different style. I agree that the tree with glowing eyes and mouth is a bit out of place but it is one of the very first drawing I made, and it inspired me to create a whole set designed in that style. I used the first group of sprites to teach to my daughter to use a bit Construct 2 and few days ago I had the idea to complete the pack adding more images and let other people enjoy it too. I am quite attached to that tree, so I left it in that way. It has 4 frames if you want to animate it, but in case you don't need the animation the 4th frame is totally black with no eyes and mouth. Also depending on the engine you use you might be able to use some effects to get rid of the blue glow and change it to white. Thank you again for your feedback and in case you decide to purchase it, please share here the progress with your game showing how you use the asset. In addition, as said before, if people are interested in the assets, I will work on something to add as HUD, pick ups and monsters. This is the second asset I have created. It is ideal for platformer/metroidvania games and good for Halloween too. What do you think about it guys? I am creating a new series of tutorial to teach how to create your first games with Construct 2. This tutorial are suitable even if you have the free version of Construct 2 and you have never used it before. The first series, where we will create a Side Scrolling Shooter, is composed of 10 videos. You can see them in English or in Italian. Pure.js community · Posted in Assets pack for sale - You can use it in your jam! Pirate Jam 2018 community · Created a new topic Assets pack for sale - You can use it in your jam! Hi guys, good luck with the jam. If you need them I have created an asset pack that includes sprites, sound effects and music. Non-Game Game Jam community · Created a new topic Assets pack for sale - You can use it in your jam! Resurrect an Old Project Etc. Jam community · Created a new topic Assets pack for sale - You can use it in your jam! IO Game Jam (Over $500 in Prizes) community · Created a new topic Assets pack for sale - You can use it in your jam! 7DRL Challenge 2018 community · Created a new topic Assets pack for sale - You can use it in your jam! SalvageJam community · Created a new topic Assets pack for sale - You can use it in your jam! Pure.js community · Created a new topic Assets pack for sale - You can use it in your jam! Destruction JAM community » General · Created a new topic Assets pack for sale - You can use it in your jam! MonoGameJam community · Posted in Tools, templates, "How to get started". - NEW: New heroes stats screen during Title Page. - NEW: Heroes faces are now displayed next to the stats during the game. - FIXED: Gamepad/Joystick movement was too fast in controller selection screen. - FIXED: Players bar were messed up when going on level 2 if some players died in the previous level. - FIXED: Players dead during the first level were present in the second level as well. 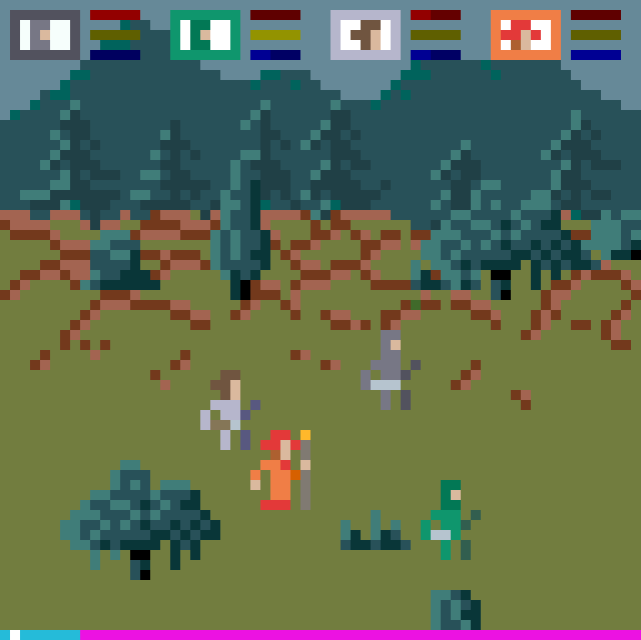 Testing heroes stats on start screen, portraits and tired animations for 64x64 ill-fated. The new version 0.2.2 has been uploaded. NEW: Added sound effect when players and monsters fall out cliffs or similar. 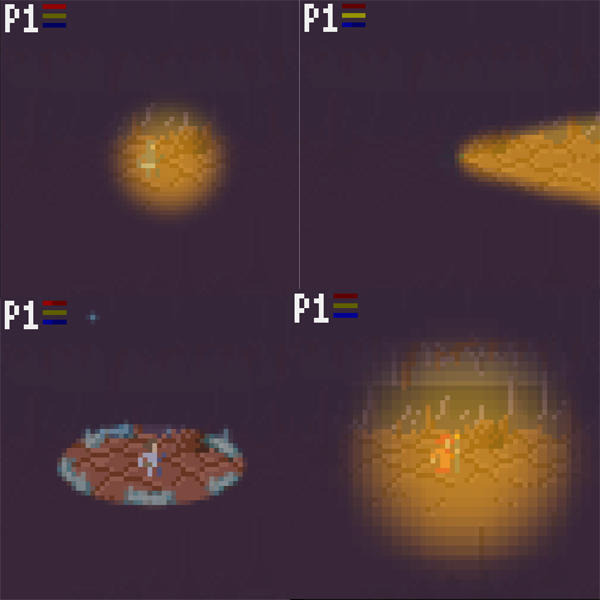 UPDATE: Added new lighting for Rogue, Cleric and Mage. UPDATE: Now Mage use also Mind while attacking and recover it slowly. Be careful to don't drain it! UPDATE: "Bullets" are stopped by scenic elements. UPDATE: Larger depth of walking area. FIXED: Dim-light in the cave. FIXED: Light source now disappear when players fall. FIXED: Sprite overlapping due to the depth was sometime imperfect.